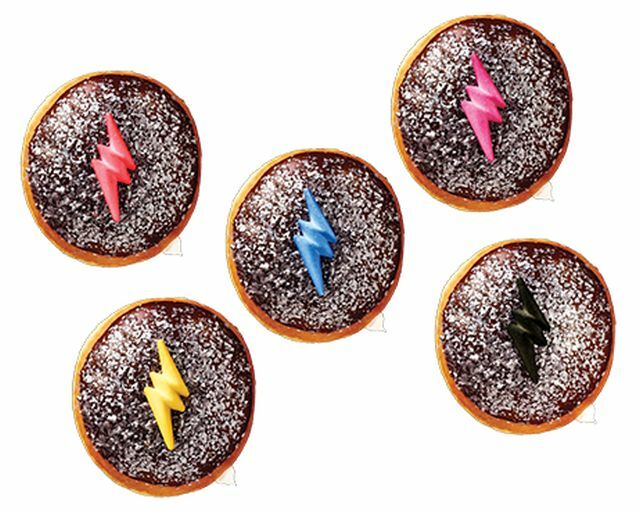 New Power Rangers Donuts are now available at participating Krispy Kreme location in the US and Canada. A promotional tie-in for the upcoming Power Rangers movie, the donuts are Kreme-filled shell donuts dipped in chocolate icing, sprinkled with edible silver glitter (yes, the Rangers sparkle in the movie...), and finished with a lightning bolt-shaped sugar piece (in black, blue, yellow, red, or pink to coincide with the five Rangers). The new donuts can be found for a limited time through April 2, 2017.